The Ozinga family immigrated to the Chicago area from the Netherlands in 1891. We talk with third and fourth-generation descendants Jim and Marty Ozinga IV about what it's like to live in a multi-generational family. 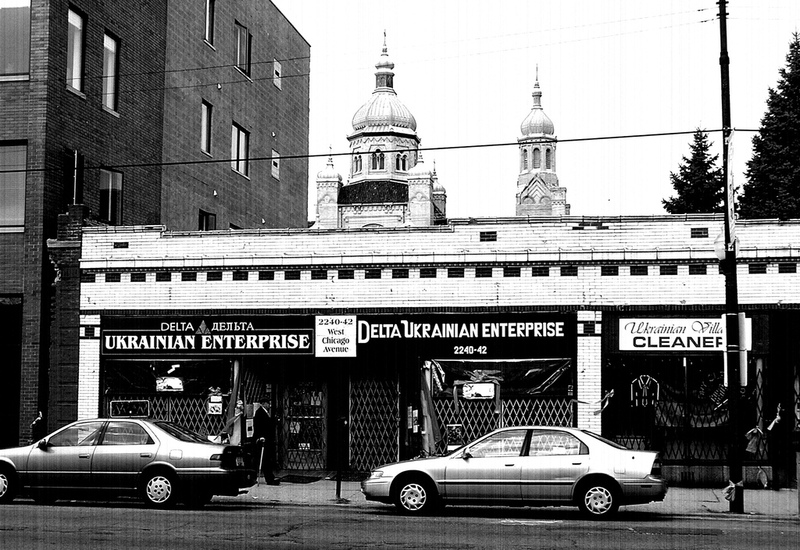 Tracy Miller, who got us started on this investigation, used to live in Chicago's Ukrainian Village neighborhood, an area still home to many Eastern European immigrants who settled there in the early 1900s. Tracy says there seems to be a lot more connectedness in Chicago than in other cities she's lived in. The Newberry Library's ChicagoAncestry map can help you learn more about Chicago genealogy and local history. 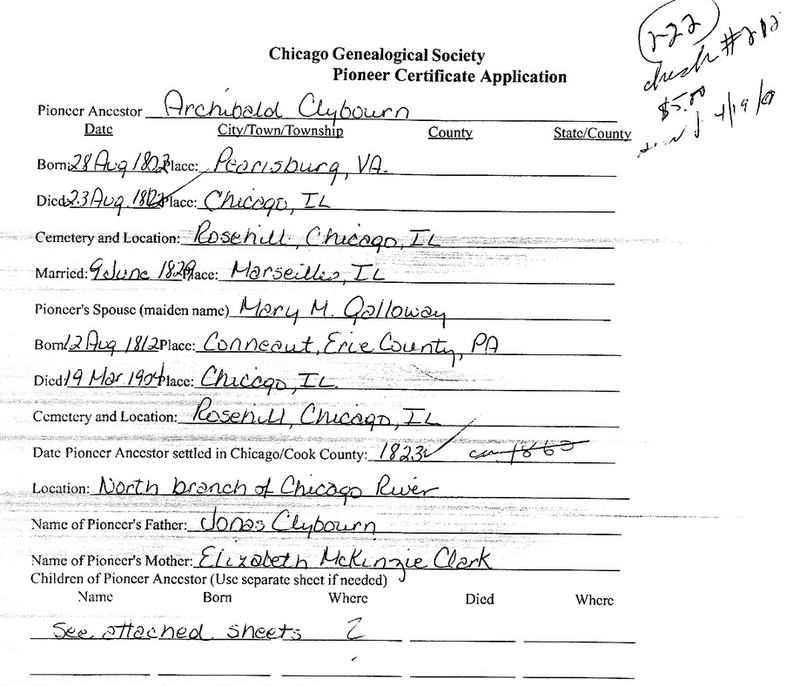 Search their CGS Pioneers collection for information about specific Chicagoans before the Chicago Fire, including this application on behalf of Archibald Clybourn - yes, like Clybourn Ave.
It’s a simple question, but the answer is complicated — and hard to pin down. We’ll confess upfront that we haven’t been able to come up with a statistic that precisely answers Tracy’s question. But the U.S. Census Bureau does collect some data that gets us close to an answer. Those census statistics suggest that the presence of local natives varies quite a bit across Chicago&apos;s neighborhoods and racial groups — while the city, as a whole, has a "native" profile close to the national average. As most people know, the Census Bureau counts — or at least, it tries to count — every single person in the country once every 10 years. But the agency also asks more detailed questions in something called the American Community Survey, or ACS. And that’s where we can find some useful information. Unfortunately for us, the Census Bureau doesn’t ask Chicagoans: “Were you born in Chicago?” And it doesn’t ask, “Where were your parents born?” But the ACS does ask people if they were born in the same state where they’re living. According to the most recent numbers (a five-year estimate for the years 2008 through 2012), Chicago had 2.7 million people. Almost 1.6 million of those Chicagoans were born in Illinois. Half a million were born somewhere else in the U.S. And 570,000 were immigrants from other countries. The key statistic here to answer Tracy’s question is 58.5 percent — that’s the percentage of Chicagoans born in Illinois. Of course, that figure includes some people who were born in the suburbs or downstate. But it’s a good bet that a significant number of these people are native Chicagoans. How does that compare with the rest of the country? Well, as it turns out, the percentage of Chicagoans born in Illinois is almost exactly the same as the national average of Americans born within their current state of residence, which is 58.7 percent. So, if you were expecting a statistic showing how special Chicago is — cue the sad trombone music — it looks like we’re actually pretty average. And how does Chicago stack up against other cities? Well, Chicago does have more local natives than New York City (where the rate is 49.8 percent) and Los Angeles (43.7 percent). But Chicago’s percentage isn’t actually all that higher than the figures for two of the cities where Tracy used to live. In Dallas, 55.3 percent of the residents were born in Texas. And 52.3 percent of the people living in Austin are native Texans. How is that possible? Remember how Tracy said that everybody in those cities “is from somewhere else”? That isn’t just her imagination. Austin has been one of the country’s fastest-growing cities, and it has twice as many people today as it did in 1985. It could be that Dallas and Austin have a bunch of people born in other parts of Texas — a higher percentage than the number of downstate and suburban Illinois natives who live in Chicago. That’s the sort of detail that these broad Census Bureau numbers don’t reveal. Which cities have the lowest percentages of locally born people? Several of these places are in Nevada. Only 1 out of 4 Las Vegas residents is a native Nevadan. On the other end of the spectrum, Jackson, Miss., has the highest rate of locally born people — 80.3 percent — among U.S. cities with populations over 100,000. Other cities ranking high on the list include Peoria, Buffalo, New Orleans, Cincinnati, Detroit and Cleveland. In those places, roughly 3 out of 4 residents are living in the state where they were born — beating Chicago’s percentage. So let’s chop. How do the numbers vary for Chicago’s racial groups? About 55.8 percent of white Chicagoans (not including Hispanic whites) were born in Illinois. And as far as white Chicagoans born in other states, more than half come from the Midwest. A little less than half of the city’s Hispanic or Latino residents were born in Illinois. That’s below the city average, which isn’t surprising. After all, more than 260,000 Chicagoans were born in Mexico, far outnumbering any other immigrant group. And only 21.4 percent of Chicago’s Asian-Americans (another segment of the population dominated by recent immigrants) were born in Illinois. But 75 percent of Chicago’s African-Americans were born in Illinois. Paral says the vast majority of the city’s young blacks were born here, but older generations include many who arrived from the South during the period known as the Great Migration, roughly from 1910 to 1970. Almost 80 percent of those black Chicagoans who were born in other states come from the South. Geography offers another way of chopping up the numbers. We created a map showing the percentage of Illinois natives — let’s call it “Illinoisness” — in each of Chicago’s census tracts. The map shows huge differences. There’s a part of the Mount Greenwood neighborhood on the Southwest Side with an astronomically high Illinoisness of 94.7 percent. Meanwhile, the Illinoisness is just 25.2 percent in a section of Streeterville on the North Side. Both areas are predominantly white, but Streeterville is more of a magnet for people moving into Chicago from other states and countries. And sure enough, that’s pretty much what our map looks like. All of this shows how your perceptions might vary depending on which neighborhoods you live in or frequent. And the more neighborhoods you know, the more you’ll realize how complex this topic is. Author Edward McClelland wrote about this phenomenon in his 2013 book “Nothin’ But Blue Skies: The Heyday, Hard Times, and Hopes of America’s Industrial Heartland.” He observed: “Chicago is the drain into which the brains of the Middle West disappear. Moving there is not even an aspiration for ambitious Michiganders. It’s the accepted endpoint of one’s educational progression: grade school, middle school, high school, college, Chicago.” And the presence of those young people drives down Chicago’s Illinoisness rate. Answering the historical part of Tracy’s question is just as challenging as the first part. Does Chicago have an unusually large number of families who have been here for generations? Unfortunately, census data don’t reveal whether people’s parents, grandparents and great-grandparents lived in the same cities where they are now. 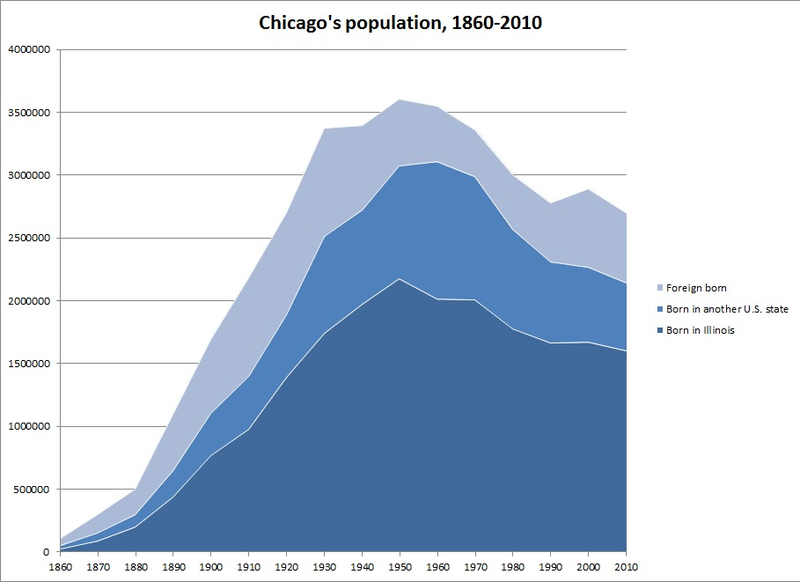 But census reports do give us a picture of how Chicago’s population changed over time. Throughout the late 1800s, 40 to 50 percent of Chicagoans were European immigrants. In 1900, their most common places of origin were Ireland, Germany, Poland, Sweden and Bohemia (now part of the Czech Republic). A fourth of the city’s population was Illinois natives. And the final fourth was people who’d come here from other states. Their most common states of origin were New York, Ohio, Wisconsin, Indiana and Michigan. “When you look at Chicago’s history ... in the mid- to late 19th century, we find a lot of transients,” Rutherford says. “Immigrants coming, settling, moving through, particularly with the settlement of the American West.” Some of these people stayed in Chicago only a couple of years, he says. But many others put down roots. It’s helpful that the Census Bureau used to ask people where their parents were born. Thanks to that information, we can calculate how many Chicagoans were children of immigrants. From 1890 through 1920, about three-fourths of Chicagoans were either immigrants or children of immigrants. Chicago’s immigrant population reached a peak in 1930, when the city was home to about 859,000 people born in foreign countries — almost entirely from Europe — plus 1.3 million children of immigrants, for a total of 2.2 million. That was 65 percent of the city’s overall population, which also had a growing number of African-Americans at the time. So, what happened to all of those people? Obviously, many stayed in Chicago. They had children and grandchildren and great-grandchildren. Some moved away or died without children. In fact, when we look at today’s census numbers, it’ll become clear that a lot of these folks left Chicago — more on that in a moment — but there’s no doubt that many stayed and put down roots. Quantifying exactly how many is the difficult part. But if you look at the trends over time, you can see what happened. After a while, those immigrant families were no longer considered immigrants. They were Americans. 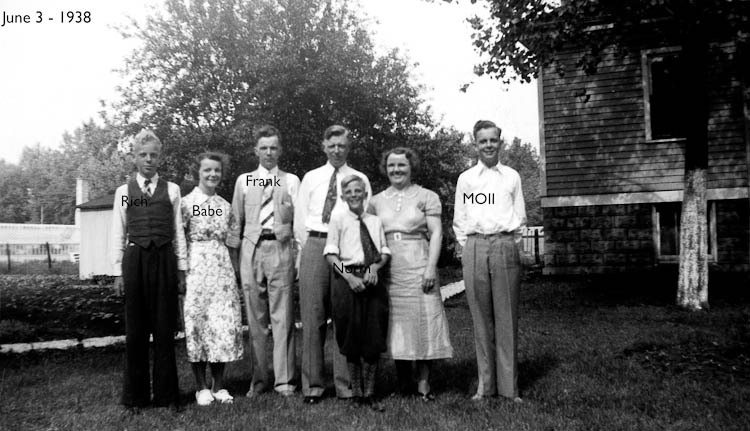 Their kids and grandkids were counted in the census as Illinois natives. After 1930, the number of new immigrants arriving in Chicago tapered off. Meanwhile, the migration of African-Americans into the city continued. As those blacks from the South put down roots here, their children and grandchildren joined the ranks of native Chicagoans. Chicago’s foreign-born population began rising again after 1970, as newcomers arrived from Latin America and Asia, but then it started declining again in 2000. Meanwhile, the city’s overall population dropped from almost 3.4 million in 1970 to 2.7 million today. Even as people came and went, even as people died and babies were born, Chicago’s Illinoisness — that percentage of Chicagoans who were born in Illinois — has held remarkably steady over the years. For the past half-century, the rate has been hovering just under 60 percent. Latinos and Asian-Americans are less likely to have roots in the city going back many decades. If you look back at 1930 (that year when Chicago’s immigrant population hit its all-time high), you’ll see low numbers for these groups. Yes, Chicago already had a well-established Chinatown by then, but only 2,757 Chinese-Americans lived in the city. There were 486 Japanese-Americans. And the 1930 census counted 19,362 Mexicans living in Chicago. Certainly, some of the Asian-Americans and Latinos living in Chicago today are descended from those pioneers, but most are likely to come from families who arrived here in the last 50 years. Now, let’s take a look at the census numbers about ancestry. It’s telling that Chicago’s three largest white ethnic groups today — Germans, Irish and Poles — were also the biggest groups of European immigrants in 1900. Today, an estimated 204,510 Chicagoans say their ancestry is German or partly German, but only 5,066 were born in Germany. An almost identical number — 204,495 — say they’re of Irish ancestry, but only 3,453 were born in Ireland. Chicago’s Polish community includes more people who immigrated in recent years, but it’s clear that most of Chicago’s Polish-American families have been here a long time: 168,453 Chicagoans say they’re of Polish ancestry, but only 43,715 were born in Poland, which ranks No. 2 (behind Mexico) on the list of countries where Chicago immigrants were born. None of this is ironclad proof that these German, Irish and Polish families have been living in Chicago for a century or longer — certainly, some moved here from other places in the U.S. — but it seems like a reasonable deduction. Most of the immigrants from those countries showed up in Chicago in the late 1800s and early 1900s. And German, Irish and Polish are the most dominant ancestries today among Chicago’s white population. Ergo, a significant number of them have been here a long time. So, what’s the answer to Tracy’s question? If you take this complex, nuanced city and try to sum it up in one statistic, Chicago looks pretty average. It doesn’t have an especially high number of local natives. But some neighborhoods do. And there’s fairly persuasive circumstantial evidence that Chicago’s population includes many African-American families who have been here more than half a century and descendents of European immigrants who arrived here even earlier. It’s hard to come up with a single statistic proving that Chicago is special, but we won’t argue with you if you continue to think so. Robert Loerzel is a freelance journalist and the author of “Alchemy of Bones: Chicago’s Luetgert Murder Case of 1897.” Follow him at @robertloerzel. Notes on data: The term “Chicagoan” refers to any person permanently residing within Chicago city limits during the years surveyed by the U.S. Census and/or American Community Survey (ACS). ACS 5-year Estimates represent data collected over a 60-month period and do not represent a single year. When possible, we chose to display data collected from ACS 5-year Estimates (as opposed to one or three-year estimates). The five year estimates tend to have smaller margins of error. Racial and ethnic categories roughly correspond to those found in U.S. Census and ACS reports. Notes: Suburbs include those located in DuPage, Kane, Lake, McHenry and Will Counties, as well as areas of Cook County outside of Chicago. Notes: The margin of error for columns in this data are high, sometimes ranging +/- 100% of an entry’s value. Source: U.S. Census, except "Born in Illinois" figures for 1860, 1910, 1930, 1940 and 1950 are estimates from University of Minnesota&apos;s IPUMS-USA database. Home For The Holidays: How Many Chicagoans Are Actually From Chicago? Where are Chicago's Poor White Neighborhoods?